When Phantasy Star IV was first released in 1993, the Internet as we know it today did not exist. The Netscape browser, precursor to today's famous Firefox, would not exist for another year. There were about 600 websites in total, with businesses having little to no presence yet. Governments were only beginning to take part. The concept of freely accessible online walkthroughs was not widespread, if it had even begun at all. In those days, most major video game companies provided a different means of seeking out help: phone service. Many a young gamer would call up Sega or Nintendo to ask for advice on clearing a particularly challenging area after getting stuck. 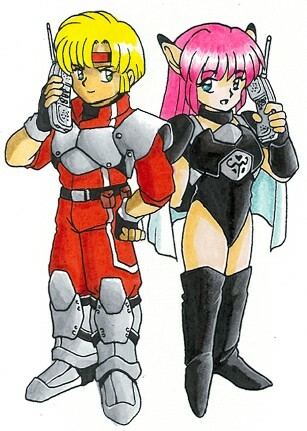 This illustration of Chaz and Rika was used to advertise Sega's game help phone service near the end of the Phantasy Star IV game manual.